Currently regarded to be the world's most valuable classic car, the Ferrari 250GTO, is a racing legend. So, for Ferrari Classiche to be home to five examples - out of 36 built - of the car currently conservatively estimated to be worth £20m a piece, this is a special moment for the factory's official restoration department. 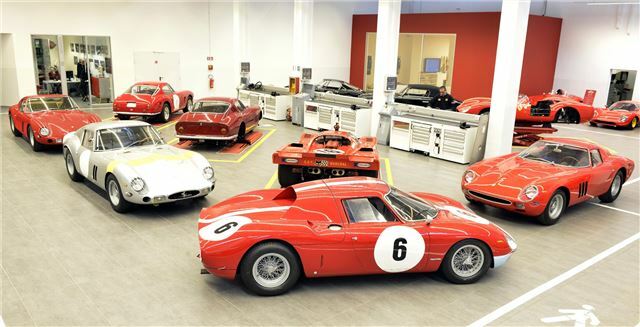 Restoration and certification work has resumed in the recently renovated Ferrari Classiche department which now boasts a packed workshop of 24 cars with some of the most significant and valuable classic Ferraris ever seen under one roof. Classiche is unique among Ferrari restoration operations because it's based at the factory in Maranello, and in many cases, work is completed in conjunction with original engineering drawings and production records. Not only is the Classiche department is currently working five of the 36 250GTOs built, but also two 250 Testa Rossas, including the 1957 car that Phil Hill drove to victory at the 1958 24 Hours of Le Mans, as well as three of 250LMs. Other cars include three short wheelbase 250GT Berlinettas, a 1956 500 TR, and the 512M that came fourth overall at the 1971 Le Mans 24 Hour. To date the Classiche department has completed over 60 full, ground-up restorations − several of which have gone on to considerable success in international Concours d’Elegance − and processed over 3800 authentication certification applications.